Planning can be a daunting task - especially writing. 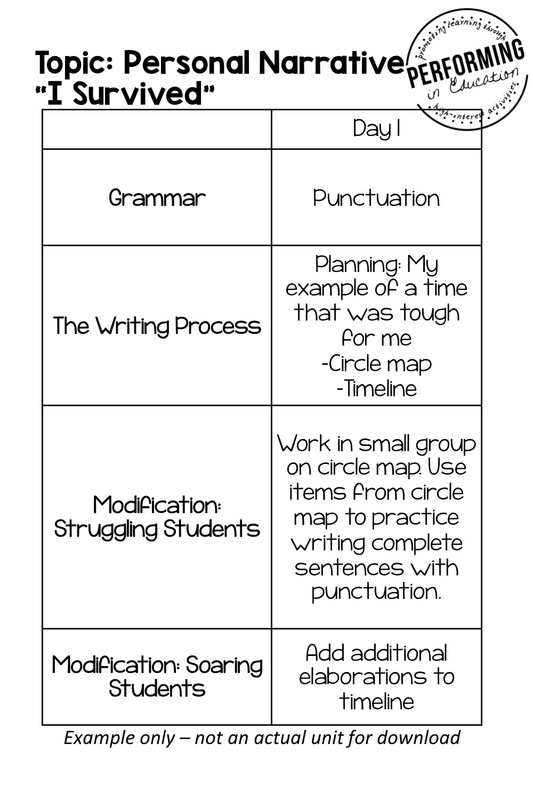 There's so much that goes into it: grammar, sentence structure, the writing process, mentor texts, and more! On top of all that, you have to also come up with ideas to make each part interesting for students. It took me many years to master planning writing, and I'm still learning new things every year! Before you even begin planning, think about a few subjects that your students are interested in. I often Google the topics to see if there are student-friendly articles or websites that would go along with my lesson, and then pick one topic based off of what I find. 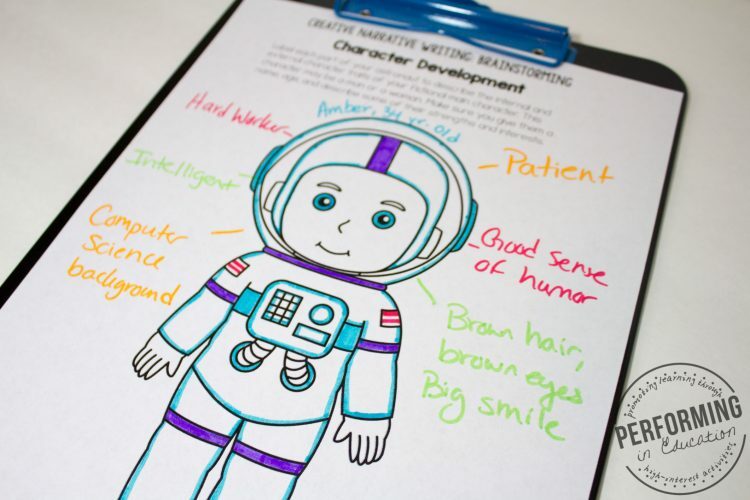 Creative narrative writing unit about the ISS! I always recommend backwards planning, but it's especially important when planning writing! Decide what you want the end result to be. Focus on the mini-lessons that will help you get this result. Choose a goal that is achievable (so not a perfect 2-page essay from every student). Keep the standards in mind as well! If students have done personal narrative writing the last 4 years, then you can focus on fine-tuning their writing. If it's their first time writing a multi-paragraph essay, then you're going to be focusing a lot on structure. Plan the entire unit out at once so that you're ready if your students master something quickly and you need to jump ahead. I use my writing units to have every organizer easily prepared before we even begin our first lesson. You may also need to slow down your lessons. Have extra resources available for each part of the unit. If your whole class doesn't need them, you can use them in small group! Decide in the planning stage how you will differentiate for students. They don't all need to be working on different essays - despite what some administrators might think. You just need to have a plan for the students that excel and for the ones that fall behind. Extra practice sheets for each skill will be very helpful for small group, and if you're planned ahead you can also use small group to help your best writers move on to the next step of the essay. I often do this and then use these students to help introduce the part they learned to the rest of their peers the next day! 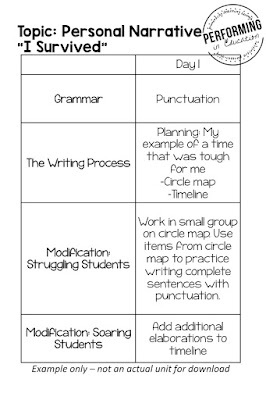 Decide how you're going to connect your writing unit to the other subject areas. What other standards are related to this topic? What books do I know of about this topic? What digital resources can I find for this topic? My students LOVE learning about space, which makes it easy to integrate science, social studies, reading, and even math into our creative narrative unit! Google Sheets is a great way to make a spreadsheet with all of these elements for your unit. Best of all - it saves it so that you won't lose it when you need it next year! 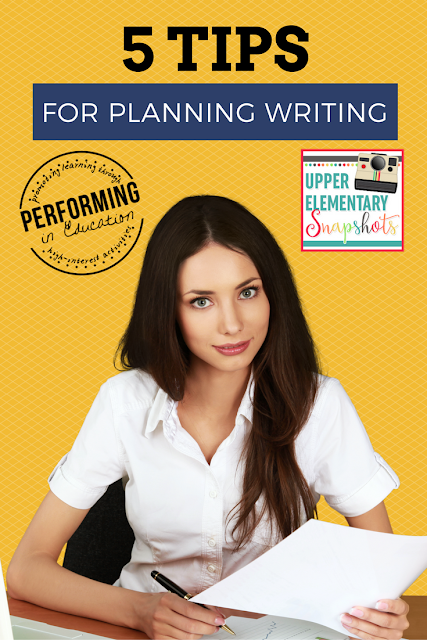 I hope that you can add some of these ideas to your existing writing planning!